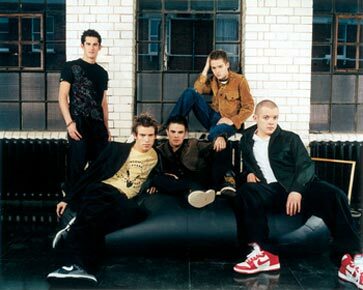 We first bumped into Derek, Damien, Ryan, Shane and Dane when they won the Best New Band Award on the Smash Hits Tour 2002. With only a handful of up and coming boy bands on the scene it seems that Blue have marked out D Side as their tips for the top and throughout December they invited the cheeky Irish chappies out on the road with them. Not only that, but Simon Webbe wrote the bonus track of their recent single. We caught up with the guys to find out about their debut album "Stronger Together" and to see find out if they'll be watching Michelle McManus go the same way as Sneddon and One True Voice. Q: Were on the last date of the tour in the biggest indoor arena in Europe. How's the Blue tour been going for the past month? Derek: It's been great. We were actually surprised at how many banners we've got across the whole tour. Damien: There's not one day we'd actually say was bad. A lot of kids do know who we are, but to have the audience completely standing up on every song is breathtaking. This place is huge though. We saw Westlife here once and even though it's looks amazing on screen it's easy to get lost, we must look absolutely minute. Q: What's it like doing something like this after the MTV Hits parties which are to about 1000 people? Shane: It's obviously different but you still get a buzz of it. When you do like the MTV Hits the crowd are right there so you actually see them and have a bit of fun. These places are so big, there's thousands of people out there. It's different feelings but they're all good. Q: The albums out early in the new year. You actually finished the album over the summer, but it's been a long journey hasn't it? Derek: About 2 years. We actually thought it was finished a few times and then a few more songs came along. We know we put a lot of effort into it and were very proud of the tracks. I know it's our album and you expect us to say it, it's easy to say it's cool, but there's 17 good tracks on there. Ryan: We did some tracks in LA with Kevon Thomas, Harvey Mason and Damon Thomas who've worked with Justin Timberlake, Beyonce and Britney Spears. And we've worked Desmond Childs whose a big rock producer but has also worked with Robbie Williams and Britney. Derek: We did 3 tracks in Copenhagen as well so it will be good if people can pick out which tracks we did over there. They've got a big European pop sound to them which sounds really cool as well. Q: And the Blue connection goes a little further than the tour. Didn't one of the guys write a track for you as well? Damien: Yeah, Simon wrote the bonus track for us on the last single "Real World". We were doing a lot of shows with Simon over the Summer and we let him hear a song off the album. He was impressed with that and he had this song he wanted us to record and it's a great song. We co-wrote a few tracks on the album ourselves and "Stronger Together" was the first track we wrote, so that why we decided to call the album after it. Q: We've been spinning the album for the past few weeks. Who's idea was it to take Salt And Peppers "Push It" for "Pushin It Out"? Derek: We changed it actually. We were in LA and our A&R guy played it to us. Basically what it was was these 2 guys rapping on it and we really liked it but we wanted it to be more us, more D Side. It would have been mad actually if we'd have ended up trying to rap on it. Damien: ...I like the concept of the program. The Girls Aloud singles were excellent, but the two people they've got up for it are f**king awful. It's obvious they can sing, but they're not Pop Idol. Dane: People in the UK, they vote for the underdog. They always do, so you're never going to get a true Pop Idol. Roxanne was an amazing talent, but they wouldn't ever vote for her or even give her the credit. I think when you see someone as well like David Sneddon whose first single charted really high and then his latest one scraped in at number 19 / 25. It's not a steady fanbase whereas we've had 3 Top Ten singles, we've loyal fans who will go out and buy the record whereas in Pop Idol you get the feeling they're buying it off the back of the TV. Q: And what do you think of you're contemporary boy band rivals - Phixx, Triple 8 et all? Shane: We don't see any of them as competition, they don't scare us. Some of them might slag us off, but were doing what we do. Damien: It's good to see that a band like the Darkness coming through. As Cat Deeley said, 10 months and these guys could be potentially number 1, but they've been working their way up for years. And Jamie Cullum as well. We started off working pits at under 18s and I remember him saying he used to play to 5 people a night at one time At the end of the day these people are breaking through and hopefully it's now going start changing it around. Derek: I know it sounds weird to say it, but we've seen bands come and go in the four years we've been together. David Sneddon, One True Voice have all gone. When you start off on those programs you can only go up, whereas as we've got to work our way up from the bottom up.